We are quickly approaching peak real estate season right now and many “For Sale by Owner” sellers can miss a large chunk of the spring buyer population. 1) Much of the seasonal growth in sales transactions comes from buyers and sellers relocating to and from Ottawa and a very large proportion of buyers coming from elsewhere will be working with a Realtor on their purchase. These out of town buyers definitely need a local real estate professional to advise them on their search and this is a huge % of the spring market. DND personnel moves alone move 1,500-1,700 people to or from Ottawa annually and most of this happens between April and July. 2) FSBO seller properties may or may not be readily available for daytime showings, which is mandatory for out of town buyers, particularly those moving on the government relocation program where these buyers only have 5-7 days to buy a house. MLS® listed properties and MLS® buyer representatives are well equipped for these buyers and MLS® sellers go out of their way to accommodate the access and timing needs of these buyers who are working on a very tight time deadline. 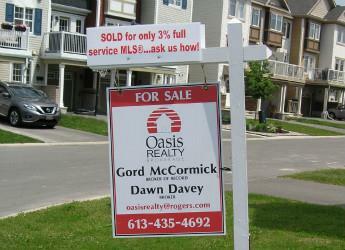 3) An out of town buyer may not be aware of the different places to look for Ottawa property listings online. So if they don’t find it, you don’t have a chance to sell it to them. Since a major FSBO marketing site is an Ottawa/Eastern Ontario organization only-these buyers may never even have heard of it. 4) FSBO sellers have limited time to manage their sale-after all they do have another full time job-so their availability and response time is unlikely to be able to match that of a full time professional Broker who is managing a listing for their seller. 5) FSBO sellers do not have the access to market data to stay abreast of what develops in the market on a daily basis. Listing inventory is running well above the 5 year average and that means increased competition for every listed property. MLS® sellers with their Broker's assistance can be on top of new listings, selling prices and price changes daily to ensure their properties remain competitive. 6) Realtors do not have time to consider FSBO listings for scheduling purposes, given the condensed period of time we have to find a property for buyers on a 5-7 day house hunting trip. FSBO sellers often have to juggle property access around their own job and Realtors often cannot adjust their schedules to meet the seller needs in this busiest time of the year. If you have been trying to sell yourself for 30 days or more at this time of the year with no success-you might want to ask yourself whether you are getting enough buyer exposure to your listing and if it is time to get a fully supported listing on MLS® so you can properly capture your share of the potential buyers. If you would like to discuss if this is the right time to change your selling strategy, please feel free to give us a call. *not intended to solicit those with existing representation agreements. What is a "mere posting"? What is a “mere posting” on the Ottawa MLS® system? For-sale-by-owner sellers (and buyers) may not be aware that there is an option of posting their listing on the MLS® system and then effectively marketing and selling it themselves, with little or no further sales or marketing input or involvement by the listing sales person or broker. This type of listing is called a “mere posting” and some small brokerages and other sales representatives have chosen to offer this service for a low cost fee. The “mere posting” type of listing came about as a result of an agreement between the federal Competition Bureau and organized real estate (Canadian Real Estate Association or CREA) in late 2011. There are no statistics on how many of these “mere postings” there have been or how successfully the process has worked. (We suspect it may account for as little as 2 or 3% of current listings, so it is not a widespread practice) Given the very complex regulatory environment for real estate, most mainstream brokerages have chosen not to offer this service. One principal reason is that while a brokerage can opt out of providing the typical full listing services, it is very difficult to limit their liability and responsibility to a seller who has listed with them, so most prefer not to take the risk. There is also a fairly significant administrative burden, so the overall risk/reward ratio for brokers is not acceptable to most. This type of listing faces the same sort of challenges and uncertainties for a seller as any “for-sale-by-owner” type of listing but does have the advantage of the listing appearing on the MLS® system. If you would like to hear more about “mere postings” or other low cost ways of selling your property, please give us a call. (we would consider offering a mere posting service to clients who have bought a property with us but not as a standalone listing service) not intended to solicit those with existing representation agreements. If you are planning ahead and contemplating a for-sale-by-owner listing on one of the many online posting systems, you may want to check us out. You could be surprised to see how little it will cost to have a professional brokerage launch, advertise and manage your listing on the Ottawa Real Estate Board MLS® system, where you maximize your exposure and market value. If it seems like a long way off, it really isn’t! No better time to start planning than right now. If you would like to meet with us to discuss the marketing strategies we would use to successfully get your listing sold, we would be happy to do so. We can also give you a bit of a “report card” on your home’s listing readiness and some pointers on things you can do between now and listing time to help optimize your property presentation. Watch this page or like us on facebook or follow us on twitter, for information including: “for-sale-by-owner” tips, contests and special social media only offers.